“The Godfather” has so permeated popular culture since its publication in 1969 (movies based on it were released in 1972, 1974 and 1990), that two characters in a movie made thirty years later could discuss it, relate to it without explanation, and even refer to it as the I-Ching of modern Americanism, all without losing us for a second. This is all the more extraordinary since the whole book is about characters who live in an essentially evil, hermetically sealed world. Whatever the morality of the protagonists, there is no denying that Mario Puzo wrote a classic of popular literature, one known the world over. The odd thing is, not many people these days have read it (although most have seen at least one of the three movies). This is not surprising, because although it’s a thrilling read, it’s too short to be a saga and too long to be a popular reading choice. And the writing (let’s be honest) is strictly utilitarian and gets the plot across, without any flashes of brilliance or flights of poetic mastery. It’s as blunt as an axe to the face, and doesn’t pretend to be anything else. It’s strength, like many novels based on real people and real events, is in what we discover about a previously unknown world and about people we think we know, or could. On that level, it’s a masterpiece. Puzo, a former NY city reporter, purportedly culled many events and characters and situations from extensive interviews with the inhabitants of the underworld (many have remarked on his fictionalization of Frank Sinatra and Bugsy Siegel, as well as his history of the New York ‘Five Families’). He remarked in an interview in the early seventies, that he’d go into a bar in Little Italy, and well dressed men he didn’t know would tip their hats, call greetings and send a drink over. It’s actually surprising, given the code of omerta about which he writes, that he got as much access as he did. Be that as it may, “The Godfather” as a novel is a great piece of work which I’ve enjoyed rereading for many years. Yes it’s not quite a saga, but it comes close, and it explores the themes of power passing between the generations, an entire society living cheek-by-jowl with the ‘normal’ world, with its own fascinating subculture and mores and rules, and it hooks us right from the get-go with the court scene involving Bonasera the undertaker, the quick vignettes of others requiring the Godfather’s help, all segueing into the famous wedding scene Coppola filmed so adroitly in his first movie. All the main characters are introduced here: Michael the reluctant son; Luca Brasi, the fearsome executioner; Sonny, Tom Hagen, Tessio, Clemenza, Kay, and, of course…the Godfather himself. Everything follows from there: the Turk’s proposal, the attempt on Don Corleone’s life, the war between the family, Michael’s stepping up to his destiny, his exile to Sicily, and his return after Sonny’s murder. It says something for the strength of the story (and how well we know it), that nobody reading this is in any doubt about what or who I’m referring to. 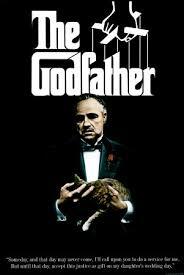 The book does go further than the first movie did by describing how Vito Corleone rose to power (this was covered in the second film) and this also gives it more of the stature of a saga. Where it falls, I think, is when it diverges from the central characters and follows a secondary personage for a while: Fontane in Hollywood, for example, or the doctor in Vegas. These detours are unnecessary in my opinion, but serve, in their own way, a curious purpose: they act almost as apologias for the actions of a man (and his world) which are, at bottom, evil. And consider the closing scene of the novel, and what Kay and the don’s wife do. The premise that Puzo brought to the story is that the Corleones didn’t start out evil as so much as developed a way to live a life which protected them and theirs from the vicissitudes of untrammelled power wielded without morality by others. This is quite a novel concept, though somewhat questionable, since Puzo also carefully avoids mention of lives destroyed by the actions of the protagonists involved in prostitution, gun-running, extortion and the drug trade. Still, in today’s society where the middle class is shrinking and the disparity between the haves and the have-nots is widening, where justice is a myth and where corporate officers and politicians enrich themselves at the public trough without check (and bail themselves out using patriotic rhetoric to camouflage their depredations), perhaps having a self-contained society where the rules are known and retribution is fierce and sudden, is an attractive proposition. And look at what we have walked away with, from this one book: “I’ll make him an offer he can’t refuse.” “Go to the mattresses.” A man’s destiny. The whole business of omerta, the Cosa Nostra, Italian crime families and the way film-makers have used them to make their bones (think “Donnie Brasco”, “Goodfellas” as well as the trilogy based on this novel). Characters we know as well as any childhood fable, and love, betrayal, revenge, murder. Who could ask for more from any tale? Pedestrian or otherwise, there’s no question that The Godfather has popularized crime fiction like no other book before or since. And along with that, colonized our imaginations about what it means to be part of such a world. Who among us has not wished at least once, to have someone to bring our problems to. Someone who has real power, who can wield justice, who can redress wrongs or assist in one’s life? Puzo’s contribution is to answer that question for us: someone, in fact, just like the Godfather.